To determine the influence of anatomical features of both the tibia and femur on quantitative pivot shift of anterior cruciate ligament (ACL)-injured patients. 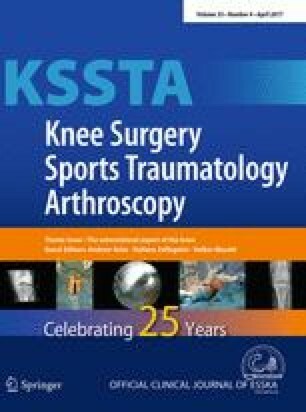 Fifty-three consecutive ACL-injured patients (mean age 26 ± 10.1 years, 36 males) who underwent ACL reconstruction were prospectively enrolled. Two blinded observers measured the parameters of medial and lateral tibial slope, femoral condyle width, notch width, bicondylar width and tibial plateau width on magnetic resonance imaging. The same examiner performed pivot shift under anaesthesia, while a previously validated image analysis technique was used to quantify knee kinematics during examination. The median lateral compartment translation detected during pivot shift testing (2.8 mm) was used to classify patients into “low-grade rotatory laxity” (≤2.8 mm) and “high-grade rotatory laxity” (>2.8 mm) groups. Twenty-nine subjects were grouped as “low-grade rotatory laxity”, and 24 subjects were grouped as “high-grade rotatory laxity”. Of the tested bone morphologic parameters, lateral tibial plateau slope was significantly greater in “high-grade rotatory laxity” group (9.3° ± 3.4°) compared to “low-grade rotatory laxity” group (6.1° ± 3.7°) (p < 0.05). Lateral tibial plateau slope was a significant predictor of “high-grade rotatory laxity” (odds ratio 1.27, p < 0.05). A tibial slope of 9° and greater predicted “high-grade rotatory laxity” (sensitivity 63 %; specificity 72 %). Increased slope of the lateral tibial plateau might be an important anatomical variable predicting high-grade rotatory laxity in patients with ACL injury. The finding can be useful in the clinical setting in predicting potential non-copers to conservative therapy and aid in the individualization of the reconstructive procedures of patients. Prospective diagnostic study, Level II. Volker Musahl, Freddie H Fu and James J Irrgang are part of the group that holds the patent for the software utilized for quantification of the pivot shift in this manuscript. Volker Musahl received funding from Smith and Nephew as an educational consultant, not related to research presented in this manuscript. Freddie H Fu, as chairman of the department of orthopaedic surgery, oversees all research funding for the department. The Department of Orthopaedic Surgery of the University of Pittsburgh receives funding from Arthrocare, Synthes, Stryker, Johnson & Johnson, DePuy, DonJoy, Breg, Omeros, Biomet, Mitek, not related to the research presented in this manuscript.